Cook's Bay is a large bay of Lake Simcoe. It is famous for it's jumbo perch fishery and trophy pike. Largemouth bass and smallmouth bass also call this large weedy bay home. The holland river empties into the south end of Cook's Bay and is a well known spring hotspot for big crappie and jumbo perch. PIKE Northern Pike are abundant in Cook's Bay due to the weedy and shallow habitat which is the main feeding ground for pike. Trophy Pike up to 20lbs have been caught in the past, although the average northern pike caught is 4-6 lbs. 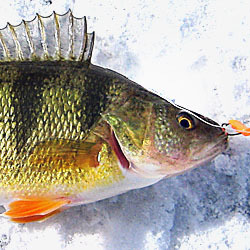 Forage is abundant in Cook's Bay, with pike mostly feeding on perch, sunfish, small bass, suckers, minnows and frogs. Perch pattern crankbaits trolled along weedlines can be productive. Spinnerbaits casted around weed beds can also be deadly. In winter, suspending large suckers or dead smelt with tip-ups rigged just above weed beds can be very productive. LARGEMOUTH BASS Largemouth Bass are common in Cook's Bay, due the abundance of weeds. The south end is particularly productive for largemouth bass, where they can be found amoung reeds and lily pads. Topwater baits are very effective for largemouth bass, especially early in the morning and at dusk. Trophy bass in excess of 5lb are caught annually, although the average Cook's Bay largemouth bass is 2-3lbs. Don't overlook the holland river for bucketmouths. The reeds that line the river for miles are a well known hotspot for largemouths. Plastic worms or jig n pigs pitched into the heavy cover produces many bass. SMALLMOUTH BASS Smallmouth bass are abundant in Cook's bay and are found in the deeper waters of the northern sections of the bay. Fishing points, sunken islands and rock piles are key target areas for smallmouth bass. Forage consists of perch, minnows and crayfish. With the introduction of the invasive gobies into Lake Simcoe, lures which mimic this prey can be very effective. 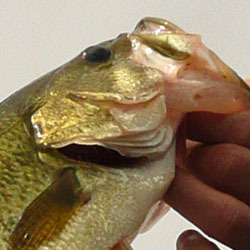 Drop shoting is also a very popular technique used to catch smallmouth bass, plastic baits which mimic crayfish or minnows can be deadly, especially during the fall. CRAPPIE Crappie are common in Cook's bay, especially in the spring when they school up and move shallow into spawning ground. The holland river can be very productive for crappie once the fish move in. Crappie are also caught sporadically during the ice fishing season especially late ice in March. Small tube jigs or pinhead minnows seem to be the baits of choice for Cook's Bay Crappie fishing. Each detailed map provides depth, contours, structure, boat ramps, and updated fishing information. 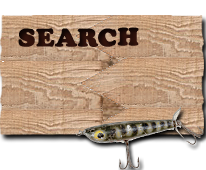 Cook's Bay fishing maps also include lake info such as gamefish abundance, forage base, water clarity, weedline depth, bottom composition, complete latitude/longitude grid lines and dozens of GPS waypoints & coordinates.